I had a great day on Friday at MadLab with Palmerama, Mr Baldry , Matt Booth and Chris Wilson getting to grips with a bit of Arduino programming. 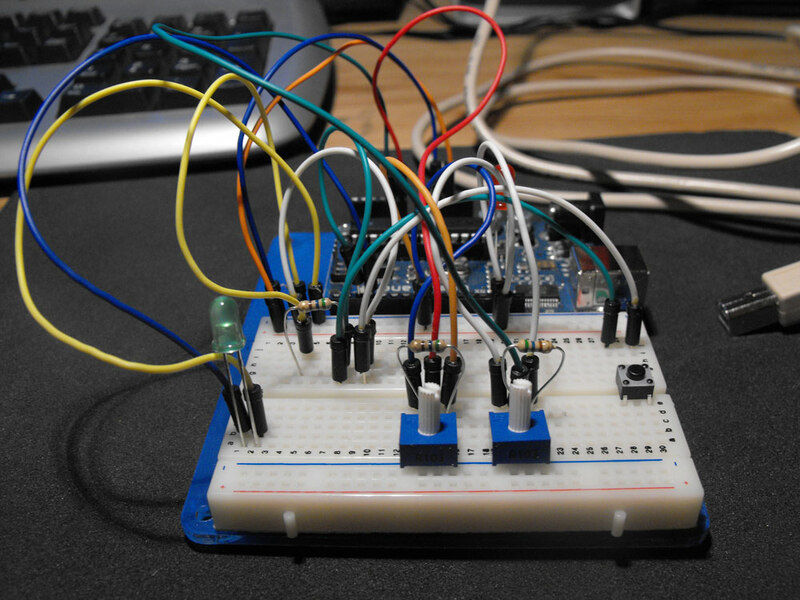 It mostly involved switching LED’s on and off, but it was a simple way to learn how to use the Arduino hardware. Some of us were hoping to get Flash talking to the hardware by the end of the workshop, but we ran out of time. So I had a mess about with it today. I made a couple of circuits to control various properties of a rectangle in Flash. The first potentiometer is to control scale, the second potentiometer is to rotation and the button alters the y position when the push button is pressed or released. Also, to demonstrate Flash talking back to the hardware, the green LED fades according to the value of the first potentiometer (which Flash sets). Nice one, Jamie! Puts me fixing my toilet tonight to shame.